Did you know you can make s’mores with chocolate chips or morsels? Yes, you can (and they melt faster than a chocolate bar does)! Are you a master marshmallow roaster? S’mores are the quintessential summertime (or campfire) American treat, and we’ve got s’more tips for you. We all know that roasting marshmallows is an art form. For those of us that like our marshmallow piping hot and gooey on the inside, perfectly toasted on the outside, it’s heartbreaking to see it burst into flames when we get too close to the fire. But if you like your marshmallow well-done, briefly stick it into the flame until it catches fire. Let it burn only a few seconds, until the outside is dark brown and crackled, then blow out the flame. 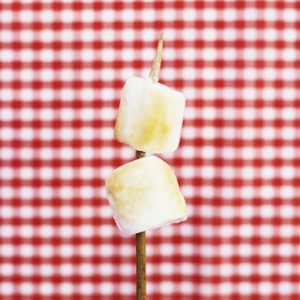 Get more marshmallow roasting tips here. If you’re using chocolate chips or morsels, just push the morsels directly into the hot marshmallow and cover with a graham cracker. You’ll have a melted chocolatey puffy treat in no time. Change the graham cracker to a vanilla wafer or shortbread cookie for a different flavor. Or mix salty and sweet by using saltines. You can even use chocolate chip cookies! Another great thing to add is peanut butter or jelly – or both. A peanut butter jelly s’more sandwich! Another fun way to eat s’mores is to make them indoors. Unlike traditional campfire s’mores, these are made with similar ingredients, can be made in any weather, and they aren’t nearly as messy. Here’s another way to make s’mores ahead of time to save on the mess and hassle with a fire. I hope you enjoy these tips and get out there and enjoy a summer full of s’mores.